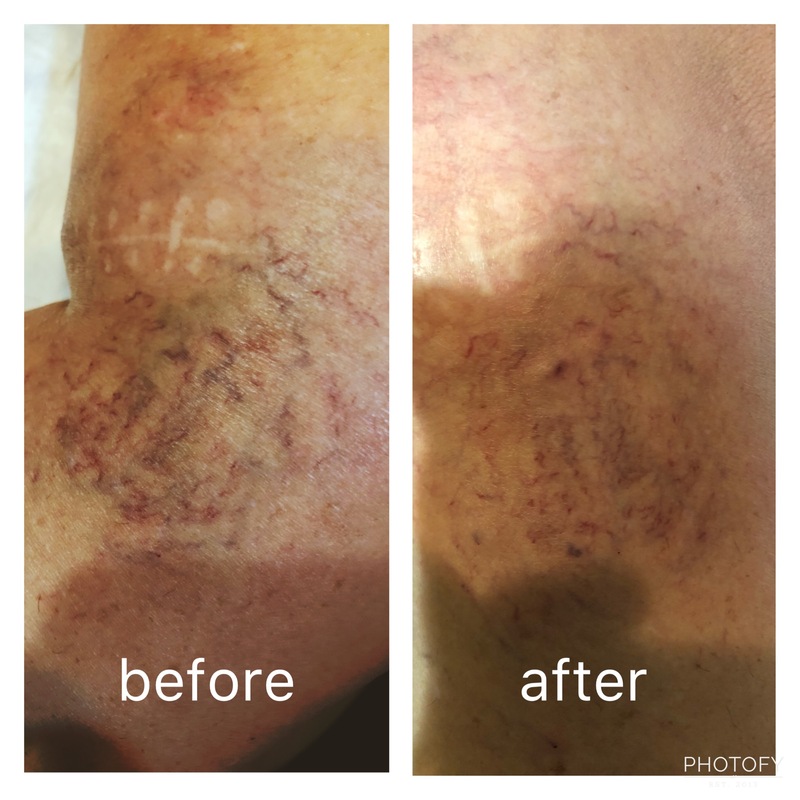 Sclerotherapy is used to eliminate varicose veins and spider veins. Sclerotherapy involves an injection of a solution directly into the vein which causes it to collapse and reabsorb back into the body. After treatment, the veins will fade over the next few weeks. Sometimes it may take a month or more to see full results. In most cases, several treatments may be needed. If you are considering sclerotherapy treatment we strongly advise that you review the following information to ensure that you are able to comply with the post care instructions for best results. Wear compression stockings for 2 weeks (some patients wear them longer due to comfort reasons). Do not sleep in them. Darkness of the skin along the injection sites is a common side effect. It is caused by the hemoglobin of the blood. This will improve over time. No sun during the healing process. The sun will cause the darkness of the skin to be intensified or even permanent. Stop iron supplements with treatment. Sun screen is important on a regular basis. It is mandatory for the first 2-3 months. Spray on tanner/lotion is okay. Walk, walk, walk. 20 minutes twice a day is encouraged. Avoid strenuous exercise such as aerobics, weight training, or running for about 2-3 days, 2 weeks is preferred. It is also a good idea to avoid extreme heat with your shower or bath for the first 2-3 days. If you get shortness of breath or a rash please call the office. People usually require more than one treatment for full results. How often do you come in for treatments? The treatments are spaced two weeks apart. What is used to treat the veins? We use hypertonic saline to treat unless the veins are resistant we have other options as far as medications go, the cost of treatment will remain the same. What will the process feel like? Is it painful? It is a little uncomfortable but tolerable, however, the patient will be expected to remain still for the 45-minute process due to the complexity of the procedure. 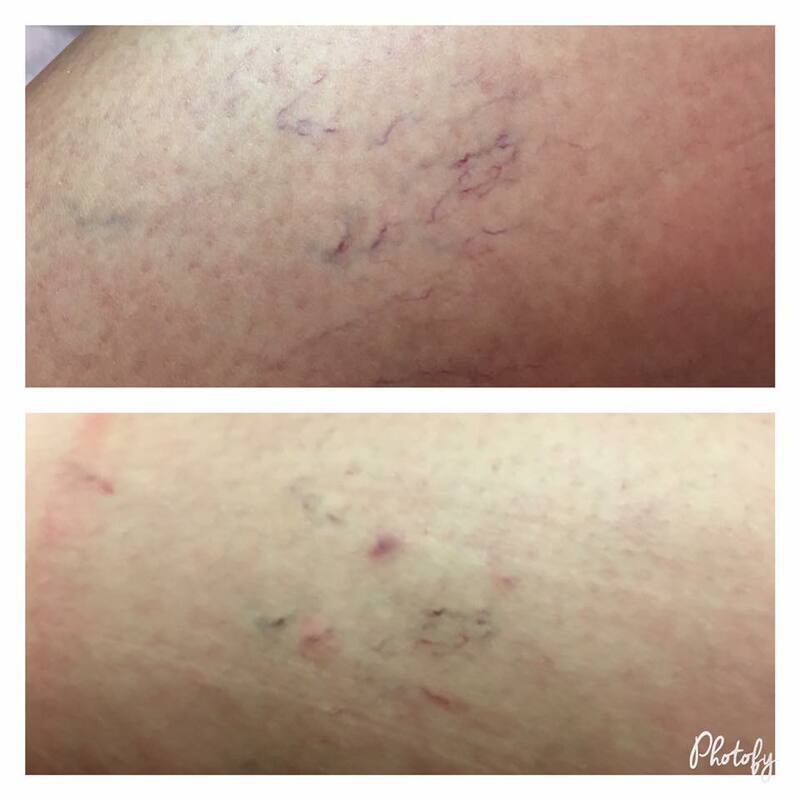 Are there any risks with vein treatments? There is a small risk of swelling and the creation of wounds with procedures, all necessary steps will be taken to prevent these but they do happen occasionally. The risk is higher in diabetic patients and any veins that are treated in the foot. This is a before and immediately after 1st treatment photo. 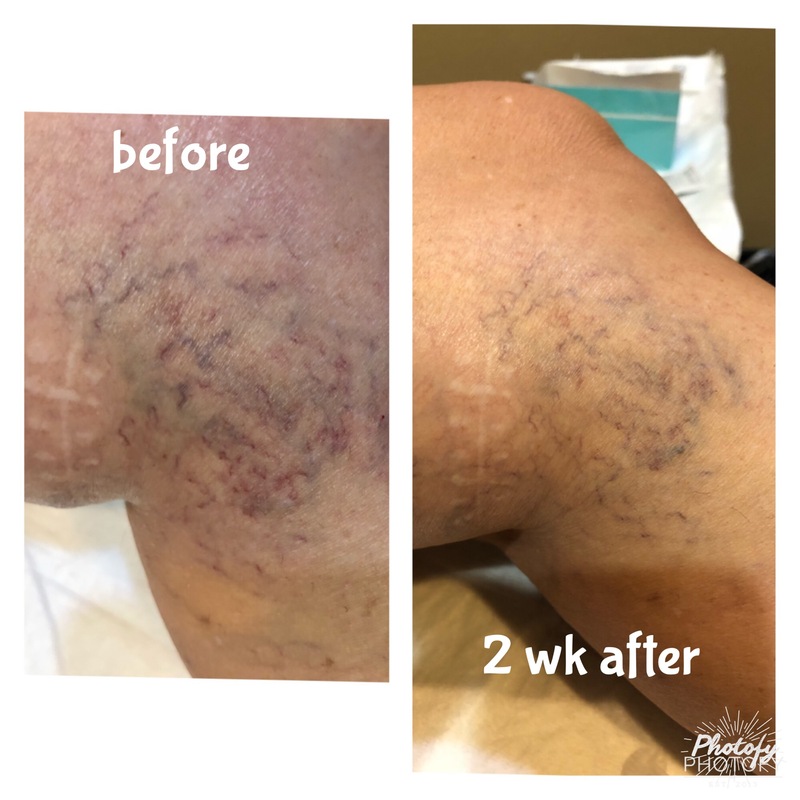 The client will continue to see a decrease in the size and color of the veins.